A new report citing sources in the Taiwan handset supply chain says Apple has contracted to produce a UMTS/CDMA hybrid iPhone due in the third quarter of next year that will enable the company to sell a single global handset to all carriers, and specifically to Verizon Wireless in the US. The report by OTR Global, provided to AppleInsider by an industry analyst, says the new "worldmode" iPhone will gain compatibility with CDMA2000 networks (including Verizon's US network, which is currently incompatible with existing iPhone models) while retaining compatibility with UMTS 3G networks globally using a new hybrid chip produced by Qualcomm. According to OTR's sources, Asustek subsidiary Pegatron will build the new hybrid phone devices for Apple rather than Hon Hai, the iPhone's current manufacturer. This decision was reportedly made to prevent the company from being "constrained by a single-source assembler." The research note also identified the new phone as having a 2.8" screen, which is significantly smaller than the current iPhone's 3.5" display. 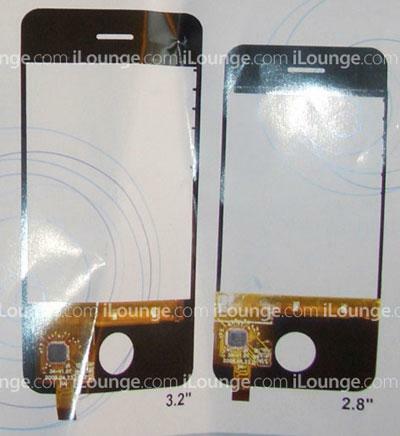 Last summer, component pictures indicating the development of a smaller 2.8" iPhone model appeared on the web next to the standard 3.5" parts currently in production, and a Chinese-language newspaper reported that an upcoming model of the iPhone would be smaller and lighter. Without any mention of both larger and smaller versions in OTR's report, it appears but has not yet been confirmed that next year's iPhone will scale down in size while also gaining compatibility with all major mobile networks. The American technological rift between CDMA providers (including Sprint and Verizon) and GSM/UMTS providers (T-Moblie and AT&T) was widely expected to remain in place until Verizon moved to LTE, the next generation of UMTS service. In other countries, CDMA providers have either shut down their networks and moved entirely to UMTS service (as Telstra did in Australia) or added a UMTS overlay to their existing CDMA service (as Bell and Telus just recently did in Canada). In the US, Verizon decided to do neither, and instead will only be investing in a new next generation LTE network that won't be completed for years. This appeared to leave little opportunity for a Verizon iPhone before 2011, but Qualcomm's "worldmode" hybrid component enables Apple to continue offering a single iPhone version that can be sold by both AT&T and Verizon in the US, and on virtually every carrier outside the US. UMTS is the 3G service associated with GSM providers, but it uses radio carrier technology (Wideband Code Division Multiple Access) similar to but incompatible with Qualcomm's CDMA2000/EVDO used by Verizon. Despite the technical similarities, CDMA2000 and UMTS/WCDMA are competing, non-interoperable 3G technologies. With nearly all mobile carriers having announced plans to shift to UMTS or LTE in the future, CDMA2000 represents a dead end. It still remains widely deployed in various markets however, including the US, where Verizon's CDMA2000 3G network is widely regarded as having wider reach and providing better data service than AT&T's newer UMTS 3G network. AT&T's 3G service is rated particularly poorly in San Francisco and New York City, where coverage holes have been exacerbated by a huge influx of data-hungry iPhone users. AT&T has yet to introduce its 3G MicroCell to enable users to solve their own dead zones at home or work. Qualcomm's new hybrid CDMA/WCDMA chip offers the potential for a single, global iPhone that users can take to any major carrier, solving the network fractionalization problem. It also solves other issues that had served as roadblocks, including the issue of user confusion that would result from Apple selling separate CDMA and GSM/UMTS versions of the iPhone. With one phone that works on both types of networks, any differences between the two (such as in features like conference calling and simultaneous voice and data, unique to UMTS) will be more apparently tied to the provider's network rather than to an iPhone model itself. Verizon's merciless attacks on AT&T's 3G network coverage in ads spoofing the iPhone's "there's an app for that" slogan were another factor which left some observers to think that Verizon could not possibly be in talks with Apple to sell the iPhone anytime soon, but the OTR report indicates that Verizon and Apple have already hammered out an agreement to sell the new iPhone model within the year. Verizon recently launched two smartphones aimed squarely at the iPhone: the BlackBerry Storm 2 and Motorola Droid. At the same time, the provider also announced a new cancelation policy that charges users a hefty $350 when they attempt to back out of contracts involving "advanced devices." Last year, the company found little lasting enthusiasm from users who assumed that the original Storm would be closer to the iPhone in terms of features; whether the new fee is an attempt to penalize unsatisfied users or to profit from switchers next year, it may result in users rethinking their purchases right now. With reports breaking the news that Verizon will be selling the iPhone within the year, sales of the Storm 2, Droid, and next year's Palm Pre may end up repressed if customers decide they'd rather wait for the iPhone to arrive instead of facing the prospect of a major cancelation penalty and the loss of their subsidy credit by buying an alternative device now. Droid reviews have largely described it as a second place alternative for users who want to stick with Verizon. That being the case, the prospect of a Verizon iPhone appears poised to deflate Droid sales this holiday season. The news might not be good for AT&T either, considering that many users have switched to AT&T solely because they wanted to get the iPhone. The availability of a Verizon iPhone may cause AT&T buyers to hold off on new purchases until they see what kinds of competitive deals AT&T and Verizon will offer once the iPhone's exclusivity with AT&T ends next summer and the new "worldmode" iPhone appears. It does however give AT&T a year to improve its 3G network and roll out the 3G MicroCell before being hit with mass defections from iPhone users irate over service issues. AT&T can still advertise that its 3G network is faster than Verizon's CDMA2000 coverage, and that it offers some features that CDMA2000 does not, including simultaneous voice and data and easy to use, multiple party conference calling. AT&T has struggled to keep up with the pace of iPhone development, failing to immediately implement iPhone 3.0's MMS and tethering features, and remaining unable to take advantage of the faster 7.2 Mbps HSPA data potential of the iPhone 3GS. The threat posed by a "worldmode" iPhone should push AT&T to deliver a year of high priority network upgrades, and potentially result in more competitive service plans.